Western blot analysis of extracts from KARPAS-299 cells, untreated (-) or treated with Crizotinib #4401 (1 μM, indicated times), using Phospho-ALK (Tyr1507) (D6F1V) Rabbit mAb (upper) and ALK (C26G7) Rabbit mAb #3333 (lower). KARPAS cell line source: Dr. Abraham Karpas at the University of Cambridge. Immunoprecipitation of phospho-ALK from KARPAS-299 cell extracts. Lane 1 is 10% input, lane 2 is Rabbit (DA1E) mAb IgG XP® Isotype Control #3900, and lane 3 is Phospho-ALK (Tyr1507) (D6F1V) Rabbit mAb. 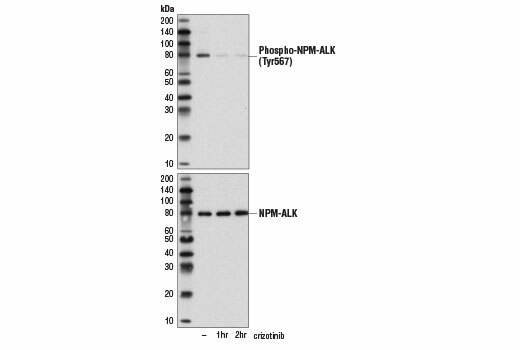 Western blot analysis was performed using Phospho-ALK (Tyr1507) (D6F1V) Rabbit mAb. KARPAS cell line source: Dr. Abraham Karpas at the University of Cambridge. 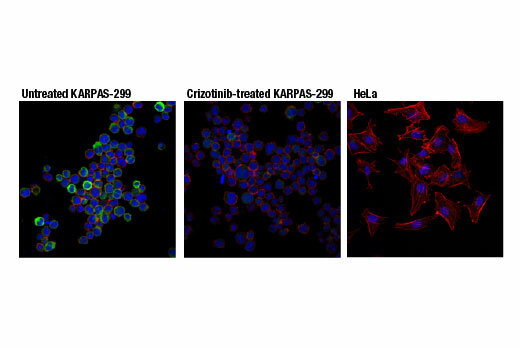 Confocal immunofluorescent analysis of KARPAS-299 cells, untreated (left) or treated with Crizotinib #4401 (1 μM, 2hr; center), and HeLa cells (right), using Phospho-ALK (Tyr1507) (D6F1V) Rabbit mAb (green). Actin filaments were labeled with DyLight™ 554 Phalloidin #13054 (red). Blue pseudocolor = DRAQ5® #4084 (fluorescent DNA dye). KARPAS cell line source: Dr. Abraham Karpas at the University of Cambridge. Flow cytometric analysis of KARPAS-299 cells, untreated (green) or treated with Crizotinib #4401 (1 μM, 2 hr, 37ºC; blue), using Phospho-ALK (Tyr1507) (D6F1V) Rabbit mAb. Anti-rabbit IgG (H+L), F(ab')2 Fragment (Alexa Fluor® 488 Conjugate) #4412 was used as a secondary antibody. KARPAS cell line source: Dr. Abraham Karpas at the University of Cambridge. 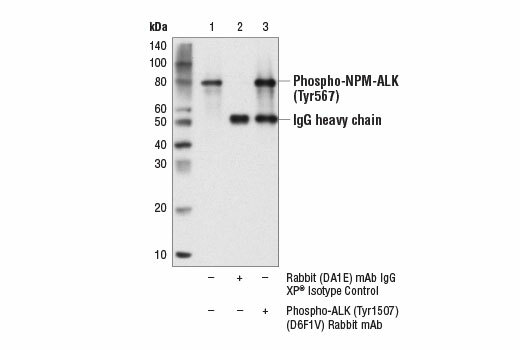 Phospho-ALK (Tyr1507) (D6F1V) Rabbit mAb recognizes endogenous levels of ALK protein only when phosphorylated at Tyr1507 (equivalent to Tyr567 of NPM-ALK). Monoclonal antibody is produced by immunizing animals with a synthetic phosphopeptide corresponding to residues surrounding Tyr1507 of human ALK protein. Phosphorylation of ALK on Tyr1507 was identified at Cell Signaling Technology using PhosphoScan®, an LC-MS/MS platform used for phosphorylation site discovery (6). 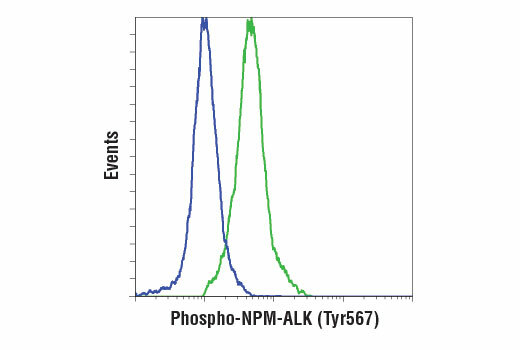 Phosphorylation of ALK at Tyr1507 (Tyr567 in NPM-ALK) has been shown to be important for interaction with the adaptor proteins Shc, FRS2-α, and FRS2-β (9,10). PhosphoScan is a trademark of Cell Signaling Technology, Inc.